In the previous article we introduced the theoretical weight of the 6m Larsen steel sheet piles and the theoretical weight of the 9m Larsen steel sheet piles. Today we are talking about the theoretical weight of the 12m Larsen steel sheet pile. 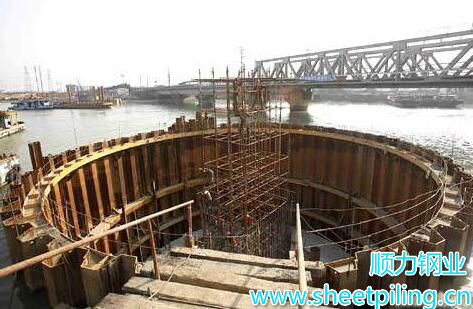 The 12m Larsen sheet pile is currently used Deep foundation pit support and box culvert construction, its use is still relatively large, so it is necessary to calculate the 12m Larsen steel sheet pile weight demand is still more, the following we look at the next 12m Larsen steel sheet theory How many tons is the weight? According to the normal Larsen steel sheet piles model, the 12m Larsen steel sheet pile has SP-2 type 12 m Larsen steel sheet pile, SP-3 type 12 m Larsen steel sheet pile, SP-4 type 12 m Larsen steel sheet pile, SP -5-type 12-meter Larsen steel sheet pile, SP-6 type 12-meter Larsen steel sheet pile, and then there are other models of 12m Larsen steel sheet pile. But currently in our domestic 12m Larsen steel sheet pile is mainly SP-4 type 12 m Larsen steel sheet pile, SP-3 type 12m Larsen steel sheet pile domestic steel sheet pile manufacturers are basically no production, and rarely imported from abroad SP- 3 type 12m Larsen steel sheet pile. Because it involves the use of 12m Larsen steel sheet pile works, generally the excavation depth will be relatively deep, the support strength requirements are naturally relatively high, and SP-3 type 12m Larsen steel sheet pile is basically more difficult to meet the requirements, so 12m Larsen steel sheet pile is generally used in the domestic use of SP-4 type 12 Larsen steel sheet pile. SP-4 type 12 Larsen steel sheet pile theoretical weight is 76.1kg / m, single 12 meters SP-4 type Larsen steel sheet pile theoretical weight is 0.9132 tons. The theoretical weight of the 12 m Larsen steel sheet piles is calculated as follows: 12 m x Larsen steel sheet pile weight (according to Larsen steel sheet pile type Chalasen steel sheet pile weight) = 12 m Larsen steel sheet pile theoretical weight. The above is about the theoretical weight of the 12m Larsen steel sheet pile introduced in the next article we will introduce 15m Larsen steel sheet theoretical weight, welcome to continue to browse, thank you. Pan Road Municipal Engineering Co., Ltd. Wuhan Branch is a steel sheet pile construction, Larsen steel sheet pile rental-based professional enterprises. Companies with scientific philosophy and a firm commitment to the integrity of customers to create value, in good faith cast the foundation.